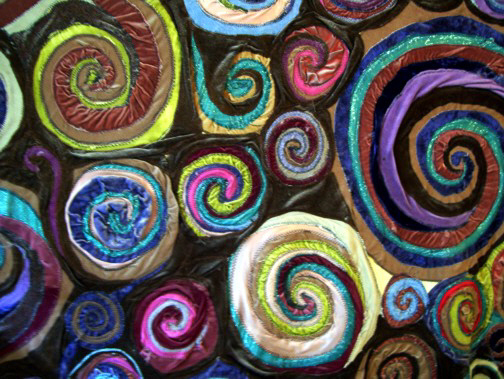 The Dollmaker has always loved the spiral as a motif in her own Crazy Quilting. her spiral antennae extended all the way out... what was this? 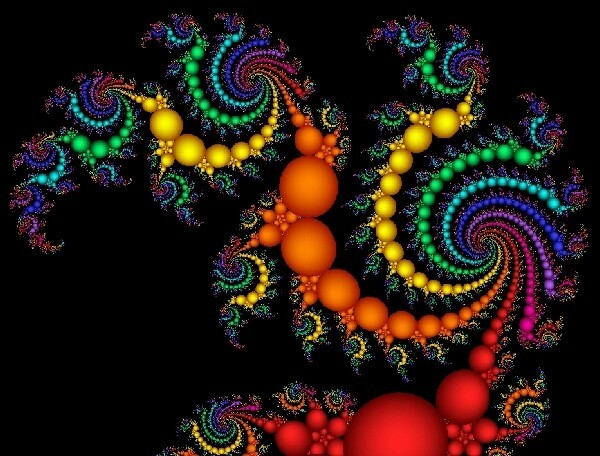 What the heck is a Fractal? we get a most intricate design. And then, a bunch of smaller and smaller stars which all resemble the larger star. 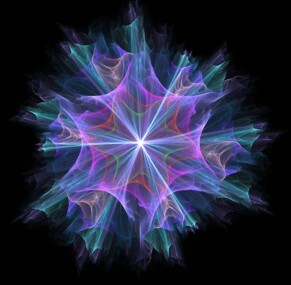 This may end up as ART, but it starts out as MATH! is a branch of mathematics concerned with questions of size, shape, relative position of figures, and properties of space. 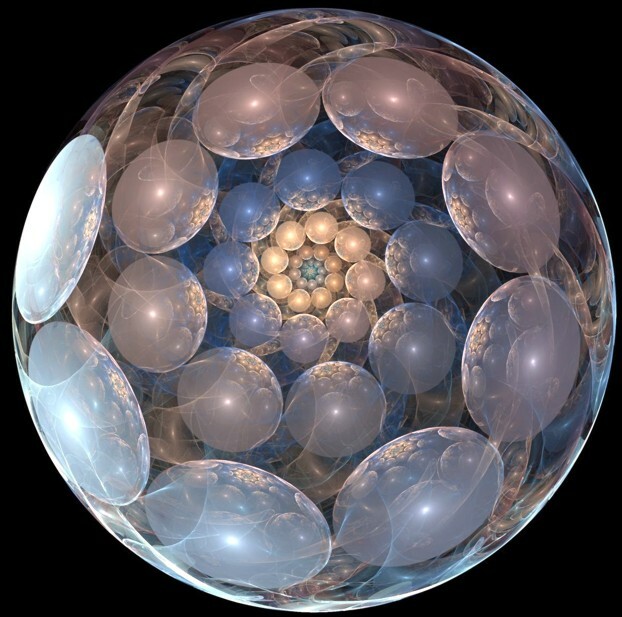 Geometry is one of the oldest sciences. It is a body of practical knowledge concerning lengths, areas, and volumes. you can have a very simple design which goes berzerk, repeating itself to infinity or at least beyond the reach of ordinary human perception. 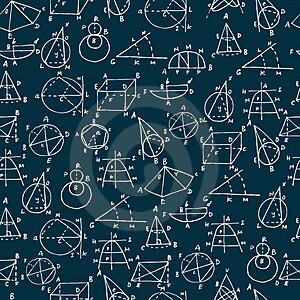 When the Dollmaker was a kid, geometry didn't look like this! 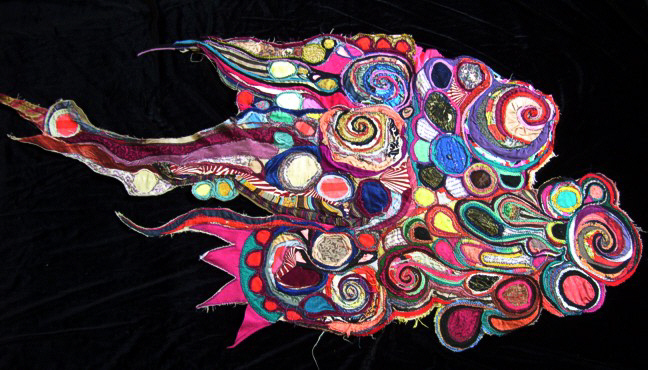 repeating itself with wild abandon. Here we have a straight line, crossed once to make a "plus". no matter how we ZOOM, inwards or outwards, the details and shapes, whether large or small, resemble the shape of the original image. This is what is meant by self-similarity. 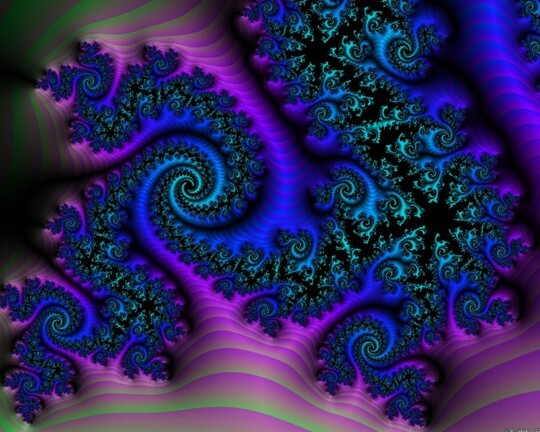 A Fractal can be anything that contains self-similar images within itself. The smaller branches look like the larger tree. 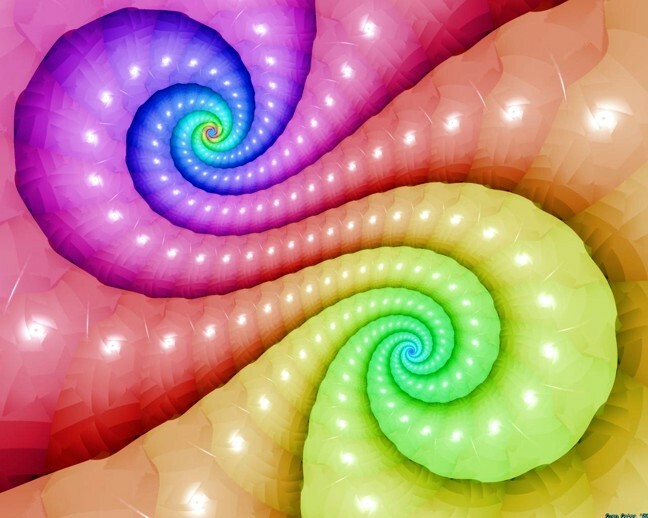 all contain self-similar patterns within themselves. 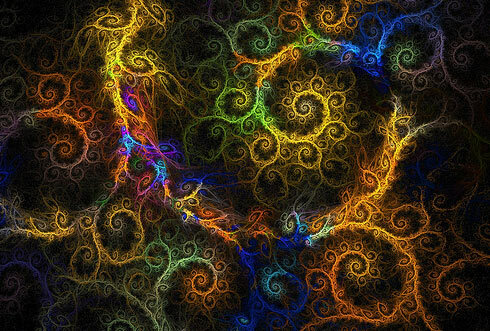 The human circulatory and bronchial systems are fractal in nature. 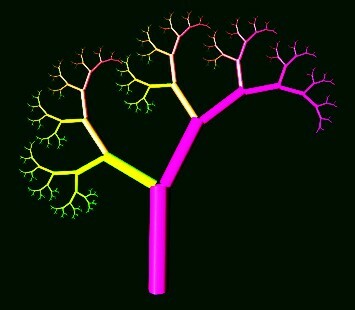 keep dividing into smaller and smaller self-similar branches. 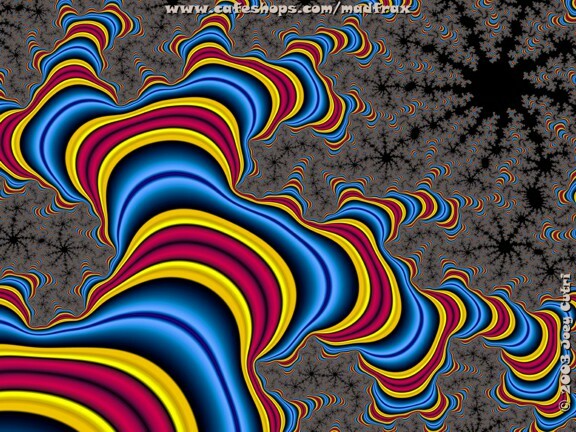 Now of course, with a very rigidly self-similar image, there's not really much point in zooming in... other than to hypnotize yourself.... as everything is the same; small detail looks like large detail, continuing on into infinity as the Fractal keeps repeating itself. 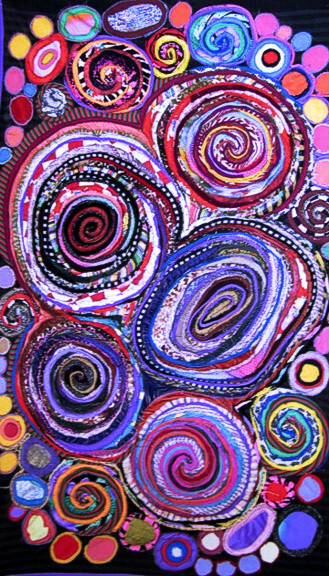 let loose Giant Twists of COLOR! The shapes and forms tease us with a little bit of familiarity, they tantalize us with new and unexpected twists. 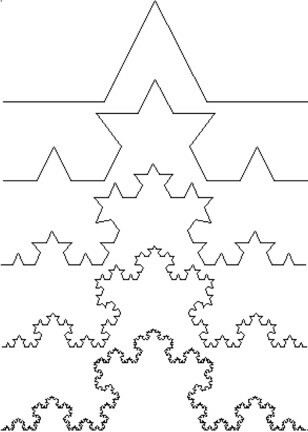 We can explore the passageways of a single fractal design for hours. We could end up seeing something that nobody has ever seen before. 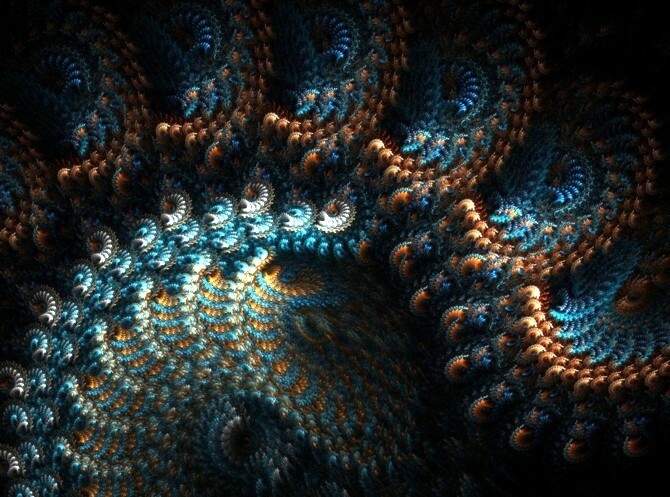 This is what makes fractal exploration so intriguing. Of course we have to shout a mightly HAIL! 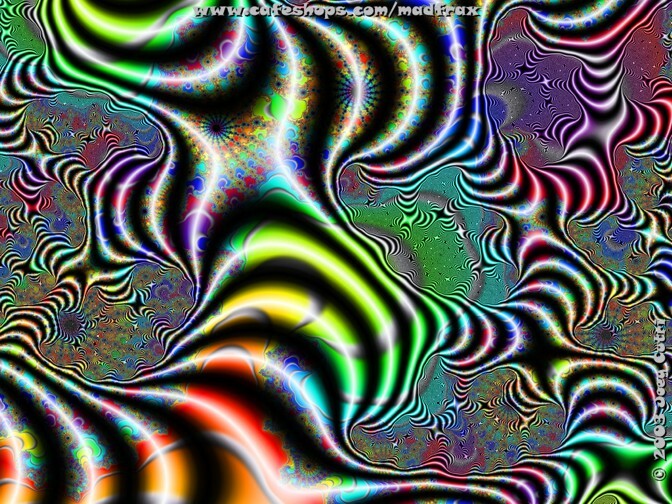 for the computers who do all the iterating (pattern repetitions) and a big cheer for Programs which translate the endless mathematical configuring into such glorious fantastical imagery, that we might happily zoom around, changing the parameters of images and losing our way in the dense twisted forests of color and form. Remember in the film "Jurassic Park"
with a Sensitivity to the idea that small differences introduced into initial conditions have dramatically significant effects on the system in the long run. In Jurassic Park, with reference to Chaos Theory (and breeding dinosaurs), the Mathematician warns that complex systems, even nice neat linear systems which ought to be predictable, will often exhibit wildly unpredictable behavior. And it's true that Scientists in many fields, stumped by mysterious deviations from expected results and feeling uncomfortably human, have had to grudgingly admit that it would be a good idea to find a way to start factoring in Chaos. 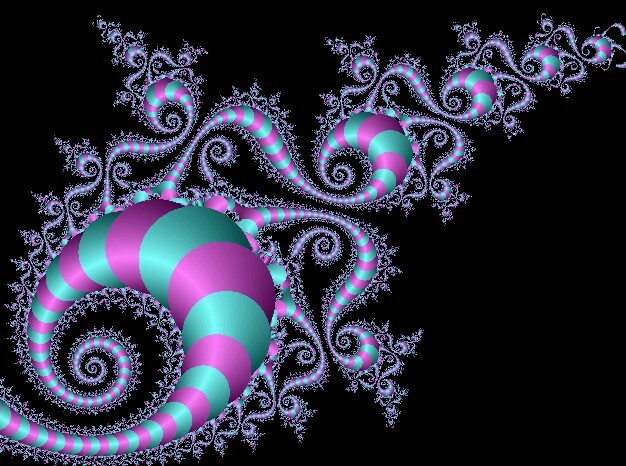 Chaos Theory definitely describes Fractals. "Prediction is difficult, especially the future." The Dollmaker can't help noticing that we may have a model here for a lot of things.